'Pleasant Work for Busy Fingers' by Maggie Browne, was published by Cassell and Company in London in 1896. The Preface states that, 'while not a mere translation', the book is based on 'Des Kindes Erste Beschaftigungsbuch' by E Barth and W Niederley, which was published in Bielefeld and Leipzig in 1880. The Foreword goes on to say that: 'I have omitted much from the German work that seemed unsuitable, or too difficult, for the boys and girls for whom I have prepared it' and 'I have also added several new designs, some of which have been sent to me by young friends who had read articles by me on a similar subject in "Little Folks". I have not been able to trace the articles referred to here. 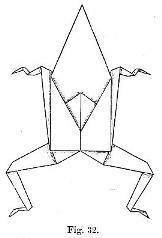 A flat version of the Blow-Up Frog. The Box (The Junk Box) (developed from the blintxed windmill base version of the Double Boat via the Boat with Fish Box and the Portfolio - neither of which are treated as designs in their own right).